Home » Blog » Seminars and events » Real Estate Seminars » Real Estate Investing vs. Internet Marketing (Which Has More Potential)? Real Estate Investing vs. Internet Marketing (Which Has More Potential)? I am featuring an e-mail I received through the mailing list of Larry Gamboa, author of the book “Think Rich Pinoy!”, with regards to two things I am very passionate about, Real Estate Investing and Internet Marketing. I’ll explain more about these in a bit but before that, I am reprinting the whole e-mail below for everybody’s reference. Three years ago, I stumbled into Real Estate as the vehicle to becoming financially independent. A book (Rich Dad Poor Dad) propelled me to act. How? By reading “Rich Dad Poor Dad”, and realizing the importance of financial literacy as the key to building a wealth foundation. I then proceeded to buy and sell (wholesale) or rent-to-own houses. Read “Think Rich Pinoy” for my story. Along the way I learned what passive rental income feels like. It felt very very good. But it also presented challenges. One key challenge is marketing. Selling. Ugghhh. Sales/marketing is not my forte. Buying property on the one hand. Selling property on the other. Wholesaling. Some say flipping. When I flip a property, I earn cash. When I buy and do a rent-to-own, I generate cash flow. Cash and Cash Flow from my real estate investments. Neat. Question: How do I generate cash and cash flow from real estate? Back to marketing/selling. Then it hit me. Marketing today cannot ignore the internet. For example, I sold a townhouse simply by advertising in www.Bahay.ph. And my tenant/buyer was a Japanese married to a Filipina. And she contacted me because of my ad on the internet. Wow! This internet experience hit me like a solid left hook. I began to snoop around. This hit home when I saw a Think Rich Pinoy Franchisee “abandon” real estate in favor of doing internet marketing full time. What gives? Are the two mutually exclusive? I knew from my experience that real estate is a good way to generate cash and cash flow. I also realized, however dimly, that internet marketing has its merits as an income generator. For example, the internet is fast and has a global reach. Can one help increase marketing and sales velocity and turnover? Furthermore, succeeding in Real Estate and succeeding in internet marketing requires time and focus. You cannot do both. So you have to choose one or the other, right? Why not synergize Real Estate and Internet marketing? Make Real Estate your core business. Internet Marketing simply supports your core real estate business. So here’s my hypothesis. Properly combined real estate with the help of internet marketing can be a dynamite one-two punch knockout combination. So, do you want to make a lot of money and truly create financial f.r.e.e.d.o.m? Here’s the two-punch combination that you can follow to achieve this goal. It’s called Real Estate Day Trading. Here’s how to do it. 1. Continue to learn how to invest in Real Estate and do deals consistently. This will be your core business. 2. Learn how to market on the internet to build a list of customers. Customers who are interested in either selling you their property, buying a property, investing as private lenders or equity partners in real estate. Step 1 – Requires that you continue to learn the business of real estate, go to seminars (ex. 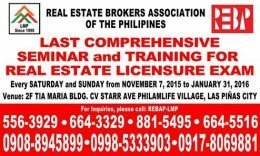 Think Rich Pinoy Wealth Seminar), and then apply what you learn out in the real world. That’s why the Think Rich Pinoy Real Estate Franchise exists. The Think Rich Pinoy Franchise requires front-end work on your part and it will jumpstart your ability to generate cash and cash flow. Step 2 – Requires that you learn how to market online, understand how to drive traffic to your websites, get people to opt in to your list and then build a relationship with them. You then sell properties and other services to them. This will bring in smaller chunks of income supplementing and augmenting your core business. I love both…Real Estate Day Trading. I am going to show you Step 1 on Saturday May 2 at 8:00am to 5:00pm. At the same time two successful internet marketing “entrepreneurs” will show you Step 2, how to use internet marketing to jumpstart and bring your real estate business to the next level. Register NOW for the seminar so you can get yourself and your friends a seat in this live Think Rich Pinoy Wealth Creation Seminar. We are going to show you the power of Step 1 and Step 2 COMBINED on Saturday May 2, 2009 at 8:00 AM. On the Live Seminar I will show you how I am slowly harnessing the power of the internet to grow my real estate business. 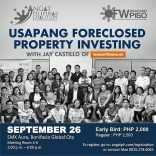 You will meet Think Rich Pinoy Franchisees who have bought and sold real estate with the help of the internet. We only have 120 seats available. Once filled you will get locked out if you don’t register early! Everyone who attends is also going to get my powerpoint “Lessons from Paquiao” which will fire up your desire to succeed as a real estate entrepreneur. When I say that you MUST be on this live seminar if you want to make ongoing income from real estate. I am not joking. We, at Think Rich Pinoy are building personal wealth doing Steps 1 & 2. We’re learning to do it every day…we know what we are talking about and we will show you the way. P.S. 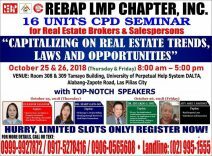 EVERYONE who ATTENDS the live seminar is also going to get a chance to Learn more about Real Estate and Earn passive income in U.S. dollars through the Think Rich Pinoy affiliate program. Find out how. Since I attended an internet marketing workshop of Jomar Hilario last year before I created this blog, I knew deep inside that Real Estate Investing and Internet Marketing really complement each other and having synergy between the two can be achieved. I have always had this thought about the synergy at the back of my mind and I never thought that Larry Gamboa himself would mention this and would come up with an event that teaches how this can be done. I guess I was right. I don’t have to choose one from the other, I can choose both! This further solidifies my resolve to achieve my ultimate goal of getting out of the rat-race before the end of this year through Real Estate Investing and Internet Marketing. By the way, If you have not yet attended the Think Rich Pinoy seminar, this is your chance. 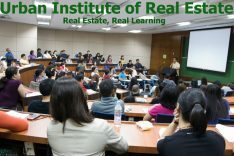 I attended the same seminar last August 18, 2007 and you can even see a picture here in the scenes from the August 18 seminar where I, along with another seminar attendee, got out of the rat-race during the cashflow 101 game which is part of the seminar (Now you know where I got my profile picture…hehe). I still remember what Larry Gamboa mentioned to me after the game when he said that all I have to do now is to “do it in real life”. Fast forward to 2009 and my first deal for the year is just like my first deal on the cashflow101 game during the seminar. Come to think of it, my most recent deal which I closed less than a week ago was done through a classic “by the book” approach, the book being “Think Rich Pinoy!”. Anyway, I’ll be sharing more details about this in a future post, do watch out for it. Let me know if you are coming to the seminar as I volunteered to help facilitate the cashflow games along with other tasks. I hope to see you there! Be a hero for a friend who wants to get out of the rat-race by sharing this through e-mail, just use the add-to-any button below.